Financial planning is the process of formulating, implementing and monitoring financial decisions to help individuals and families reach their goals. 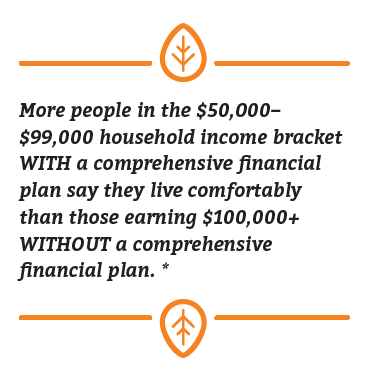 Regardless of your current level of income or wealth, a personalized financial plan can be the difference between simply having goals and achieving them. A financial plan helps you make decisions in line with your future needs and provides greater peace of mind today. Your plan will be as comprehensive as you need. Your financial plan will document the steps to achieving your goals, based on your current financial situation. It can be comprehensive or targeted to key objectives. Comprehensive financial planning is available to all of our discretionary investment management clients at no additional cost. For all other clients, financial planning services can be customized and are available at a reasonable fee.